This presentation is based on the book with the same title (Yale University Press, 2018) which examines a crucial element of state behavior -- the use of international institutions, informal alignments and economic instruments such as sanctions -- to constrain the power and threatening behavior of dominant actors. Much of International Relations scholarship fails to capture the use of these non-military instruments for constraining superior power. The soft balancing debate for over a decade has generated much literature and criticisms. However, it has been used exclusively in the context of responses by second-tier states toward U.S. power. 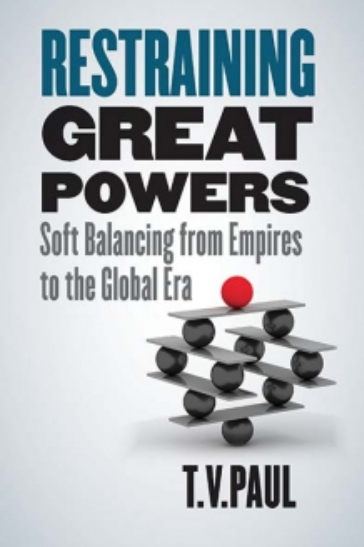 This book expands and tests soft balancing arguments to historical eras (such as the Concert of Europe, and the League of Nations during the interwar period) and the emerging/resurging powers, China and Russia while responding to criticisms aired against the concept and strategy. It seeks to explore: under what conditions do states resort to soft balancing as opposed to hard balancing (relying on formal military alliances and intense arms buildups)? When do they combine both? What are the differences and similarities between the 20th and 21st century cases of soft balancing--one under multipolarity, the other under near-unipolarity? When do soft balancing efforts elicit hostile reactions and when do they produce positive results? Finally, what are the implications of soft balancing for the rise of new great powers and the international order, especially conflict and cooperation among them in the 21st centurys globalized international system? T.V. Paul is James McGill Professor of International Relations in the Department of Political Science at McGill University, Montreal and a Fellow of the Royal Society of Canada. He was President of International Studies Association (ISA) during 2016-17. Paul is the author or editor of 18 books and over 70 scholarly articles/book chapters in the fields of International Relations, International Security, and South Asia. He is the author of the books: The Warrior State: Pakistan in the Contemporary World (Oxford, 2013); Globalization and the National Security State (with N. Ripsman, Oxford, 2010); The Tradition of Non-use of Nuclear Weapons (Stanford, 2009); India in the World Order: Searching for Major Power Status (with B.R. Nayar Cambridge, 2002); Power versus Prudence: Why Nations Forgo Nuclear Weapons (McGill-Queens, 2000); and Asymmetric Conflicts: War Initiation by Weaker Powers (Cambridge, 1994). Paul currently serves as the editor of the Georgetown University Press book series: South Asia in World Affairs. For more, see: www.tvpaul.com.